Full Adventure Multiplex 2 Rules and Guidelines Here! The Adventure Multiplex was the first of its kind ever released. Over 80 people contributed an adventure encounter resulting in a monster Minecraft map that could take over 15 hours to complete 100%. At the time of its completion, it was the longest adventure map ever made… in the world. It’s time for us to make a sequel. Join the discussion on the Minecraft Forums! 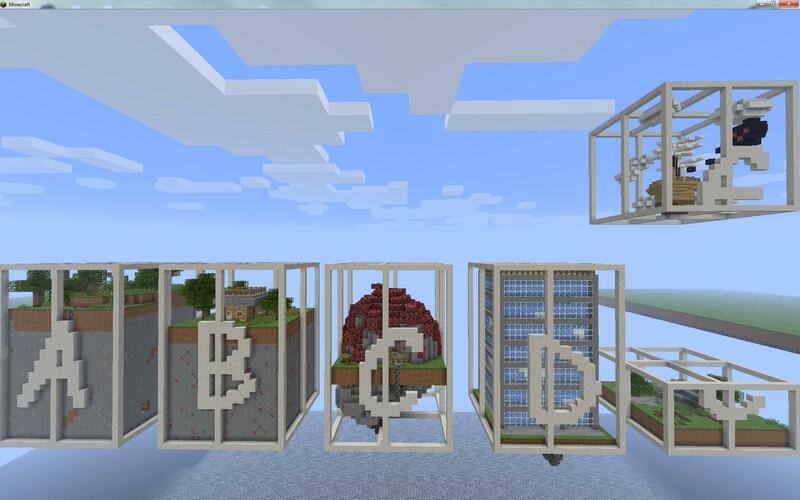 Breakable Blocks: Mossy Cobblestone with a pick, Clay Blocks with a shovel, webs + melons with a sword. These blocks may ONLY be broken in the encounters and you must give them the tools to do so. Players are permitted to place any blocks they have in their inventory. So if a player obtains blocks in your encounter, keep that in mind. You may build your encounter with 1.6 but please specify that when you submit it. 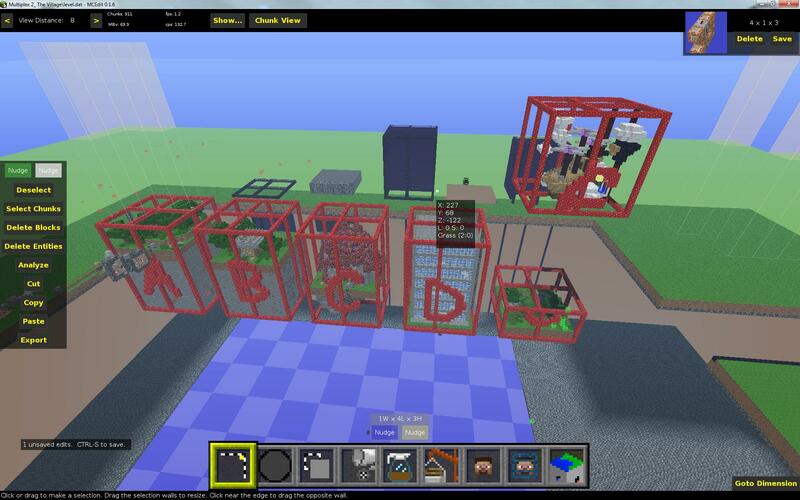 Everything you build MUST be no larger than X20 by Y30 (height) by Z20 (with one exception detailed under sky encounters) The entrance /exit boxesthat I add, or that are in the templates, may be outside this area, your redstone constructions must remain in the size limit. You must have a DEFINED entrance to your encounter and ending. If you can use Mcedit you may customize the location of the start and ending boxes. If you are not using mcedit, you MUST use one of the 20 templates provided. Once a player starts your encounter by standing on the pressure plate, they should NOT be able to leave your encounter under any circumstances until they have completed it. The encounter must be sealed. You are not allowed to give players any items or effects until they have entered your encounter. Mob Spawners are restricted to be below the ground level. Every encounter must HAVE a ground level. No ender pearls given unless your encounter is completely enclosed with no holes to the outside. Somewhere on the ground level there must be a sign that says “AMVending” that the player can be teleported to and walk away from your encounter once it has ended. The encounter must always be solvable. If you die, you should be able to still complete it. TNT will give players blocks, they are able to use them… keep that in mind. You may set time and weather within your encounter. Weather will be cleared on exit. You may split your working area into 2 pieces as shown in example E.
The bottom section must be 10 high, with the remaining 20 to be used in the sky section. You may use up to 2 hopper clocks and they may be active for the duration of your encounter but they MUST be stopped once the encounter has ended. Do not intentionally lag machines with excessive piston and redstone constructions. Remember your encounter will be surrounded by many more and played on lower powered machines so try to keep it simple… but try not to let it limit your creativity! All redstone above the ground level must be kept hidden from player view. Below ground, redstone can be visible from the sides (it will be underground), but not anywhere a player can see it. No more than 20 spawners (includes minecart spawners) in total. If you use Sethblings create statues filter; the size limit of a structure that can be created or removed is 5x5x2. Create OR delete. Not both. You may only build or destroy 1 structure. You may use positional data on spawners to spawn mobs /stuff above the ground level as long as they remain in the confines of your encounter. If you are using spawners, you cannot send me a schematic and must send the whole world file. Do not use coordinates in command blocks. You MUST use Sethbling command block sign filter structure for commands that require coordinates. When submitting your entry, the signs must remain so I can run the filter after you have submitted your entry to me. Built in feature: If you give a player scoreboard “milk” value of 1, it will clear any status effects on that player. It will also change weather to clear. You may use scoreboards, however you must have a button on your world save outside your encounter so I can initialize the scoreboards after I have imported your encounter. Which one would you like to be known as? Version it was built with: 1.5 or 1.6? If you have no idea what I’m talking about, here is the trailer for the original Adventure Multiplex which you can download here. At the time of writing this, it’s had over 75,000 downloads and millions of youtube views across tonnes of videos. To be a part of the sequel, all you need to do is follow some basic guidelines and as long as nothing is horribly broken, your encounter will be included in the Adventure Multiplex 2! Accepting entries right now! Any questions? Special thanks to Texelelf for providing me with a filter to allow the spawners to be recalculated! By submitting an entry to this competition you are allowing Jigarbov to use your entry in any way he sees fit. The primary function is to create a large scale collaborative map and every creator will be credited, however Jigarbov may use it in further projects if he wishes to do so and without credit if he forgets (though he hasn’t yet). You also agree to the terms of the competition which is that Jigarbov will choose 3 of his favorites as winners. There is no grading criteria and is strictly based on his feelings about the encounter. Full Adventure Multiplex 2 Guidelines Tomorrow! As I work on guidelines, I am also working on examples to make sure everything is clear. Everything is looking to be going on schedule despite my recent obsession with Animal Crossing. The full guidelines should be super easy to understand, but with the theme I’m working on this time I think Adventure Multiplex 2 will be bigger, better and more cohesive than last time. I also hope to get a tonne of entries. I’ve seen a few people recently think I’m going to get thousands of entries… that wont happen. I really only have limited pull, my youtube channel only has a few hundred active watchers despite the growing base (over 7000!). That said, even if I only get 5 entries, the map will still be created. I might rename it though xD. I’m really not holding onto the guidelines just for fun, I haven’t finalized them myself yet! Something to think about though: When you enter your encounter, (by way of a pressure plate) you should be not be able to escape until the encounter is completed (by redstone signal) You wont have to worry about the entrance and exit mechanics, that’s what I’m for. However there is a space required to fit the redstone so keep that in mind. Trying to get it small right now. Will have 5, fully playable examples, tomorrow as well as the full restrictions and guidelines! Enjoy this… it will probably give you a few hints of what the guidelines will be. Adventure Multiplex 2 is Coming! Adventure Multiplex was created with the help of over 80 builders. This time, I’m hoping for over 100! Tell your friends, get everyone involved. I want it to be HUGE. This one will be a little different than the first one, all details including guidelines, build size and restrictions will be announced June 14th. (still not finalised yet) Start thinking of an idea, because I want your entry! This is the trailer for the original (and also one of my favorite trailers that I’ve ever made) You can also download the map right here on jigarbov.net.